Looking at my blog (over six months without posting anything – now that’s quite shameful) it’s about time I put my paintbrush down and returned to the keyboard and attempt to write something that might inspire someone to go out and find something to paint. What better to write about than one of my recent excursion to Wales. Wales is an inspirational place for the artist especially one that enjoys painting seascapes/waterscapes and mountains (and they won at rugby on Saturday against Ireland). This excursion took place in November of last year with the intention of bringing back material for my painting classes. I brought back masses of it that cover a host of subjects but mainly maritime and mountain landscapes. Mixed in with this was some amazing material for line and wash paintings of buildings and bridges in some very picturesque settings. 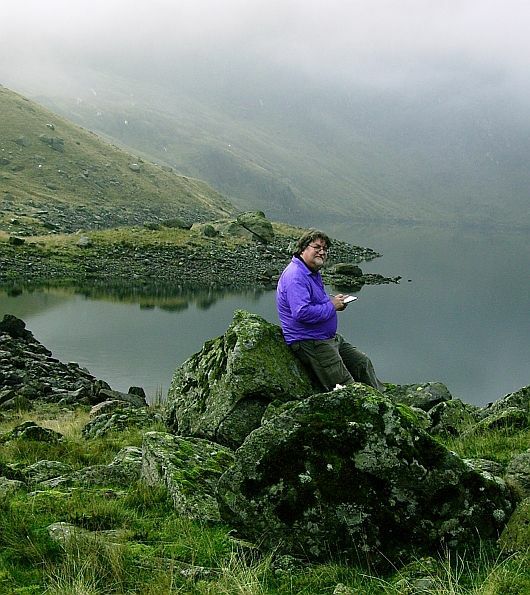 The photo (taken by my wife) shows me sketching on the shore of Llyn Llydaw, I am quite close to the ford in Cwm Dyli on the south-eastern bank of the lake. It was Wednesday the sixteenth of November about 10ish. I had my eye on the weather all week in an attempt to get a photo and some sketches of Snowdon. I have some from previous trips but you can never have enough. Despite it being a gloriously week (very unlike November) the summit had been shrouded in clouds most of the time. Well all of the time I had seen it! The good thing is that the car park on the A498, above the Afon Glaslyn, provides an amazing view of Snowdon without any effort. It’s therefore an easy task to check out the condition of the summit before committing to the £10 car parking fee at Pen-y-pass. On the Wednesday morning the day being sunny, cold and windy with no cloud on Maol Siboad (visible from the kitchen window) it did appear to be the best day to get a sketch and a photo of Snowdon. Time was running out and the spell of good weather was not looking like it would last the week out. Today I was so confident I did not even check the view from the A498! The approach up the miners track was heavenly as, despite a number of cars in the car park, the masses were heading for Crib Goch or the Pyg Track. The sun was shining and the clouds that were sitting around the slopes were fluffy and white. Clogwyn Pen Llechen and the Teyrn Slab that you see on the approach looked like the haunt of Pterodactylus in the early morning light(see the painting "Here be Pterodactylus - Clogwen Pen Llechen and the Teryn Slab - With Lliwedd in cloud" in the main gallery - Mountains). And there was not a soul about to spoil the tranquillity of the moment. But O Woe Is Me! When we got around the corner there was Snowdon totally covered in cloud as well as Y Lliwedd and Crib Goch. Undeterred I opted to do a bit of sketching by the lake as the place was quite atmospheric (and quiet – still no one around). After a short time spent by the lake we headed off up the path to Lliwedd, and still we had not seen anyone except from a distance. It appeared no one was interested in Lliwedd that day. But the views across Llyn Llydaw of Crib Goch, especially from higher up, was spectacular due to the morning light. A small diversion is perhaps worthwhile at this point in my story. I have climbed extensively in my life and like to think that I enjoyed the scenery. I must say, however, that it is only since I have painted have I truly seen the places that I visit. Sketching makes you stop and see your surroundings. Even when it is bitter cold you hold out and grab a quick sketch. It is part of the learning process of becoming an artist – you observe your surroundings. If you do not see you cannot paint it! One of the many magic statements I hear from people who paint with me is “do you know I cannot go outside now without looking at the sky and all its colours” – then you know that they have found one of the many crimson threads that lead you on to be a better artist. You do not need to be an artist to see. So next time you are out walking stop, look around, ponder what’s in front of you but even better look back at where you have come from – but now back to Wales. Just keeping below the clouds we stopped for lunch at a suitable picnic boulder and there we watched the clouds blowing along the ridge of Lliwedd where they either built up againstSnowdon’s summit slopes or blew along the edge of Crib Goch to disappear in the direction of Pen-y-pass. Very atmospheric scenery again but hope against hope I thought the clouds might just be clearing! The light by now had gone – the best time for a photo of Snowdon is around 10 – 11 in the morning before the light gets behind it. Well beggars cannot be choosers and the clouds did lift eventually – its quite entertaining doing a “can you see it” as the last wisps of cloud cling to the summit tip (despite nearly freezing to death – the week got colder despite staying sunny – my mars bar was like a brick – next time I will carry it inside my jacket). The cloud stopped away for the rest of the afternoon. I had got some amazing photos of Crib Goch earlier in the day (cloudless) and the photos of Snowdon were able to be enhanced to bring out a bit more definition prior to getting them printed. So all in all it was a good day that ended with a good meal and good company.